Interior Designer: YS Squared Inc.
Landscape Architect: Land Design Inc.
Cabinetry - Can you please tell me the wood species these cabinets are made from? That really sounds great! one thing to try with coloring the alder is a die as opposed to pigment stain what I think is happening is that in order to get the color right your having to use a heavy coat of the stain witch is basically a diluted paint where as a die will in fact be absorbed by the wood enhancing the grain instead of resting on the surface and in the open pores obscuring the wood. With the scale of your project it sounds like the added expense of using walnut will be worth it and I think it will also tie in better considering the Walnut butcher block. I hope we can see pictures soon! @rogerc We no longer have the spec sheets from our cabinet builder on this particular project. However, our project manager for The Bear Trap remembers the kitchen cabinets to be made from Mahogany. And as @Gary Finley says, the stain choice may be the crux component of the aesthetics for your space assuming you can get the correct grain profile. Happy building! Island counter - What are these on the island? But what kind of tin? Squares or? Where was it purchased? Thanks! I don't have the specific product number to tell you, but we sourced it from --> http://www.tinceiling.com/products/tiles.php Plenty of choices! What can you tell me about the pendant lights? I would love to know where to get this pendant fixture. What material are backsplash tiles from? Is the floor distressed oak barn board? I'd like to know what the name of the color on the ceiling tiles is called? Love the stools! Where did you get these? Counters - What are the materials used for both the base counters and the island counter? Anchored spaces. Because of the open layout of a lodge, rugged materials should be carried through all the spaces, with features and appliances kept to scale. The extra-large island and stone-surrounded eight-burner range anchor this space within a larger great room. Consider your ceiling, otherwise known as the forgotten fifth wall, when decorating your kitchen. 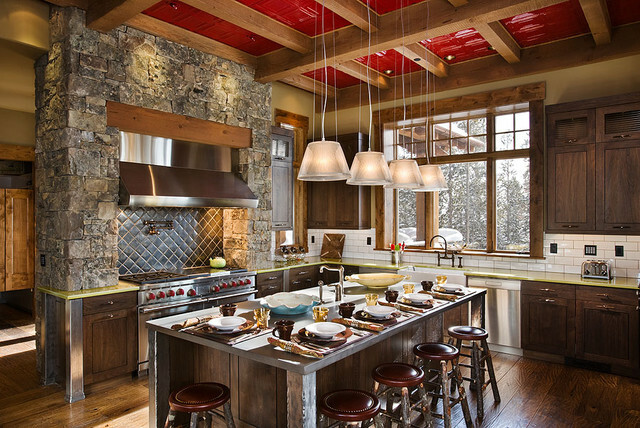 This neutral kitchen gets a wonderful punch of color via the hot red painted tile ceiling.